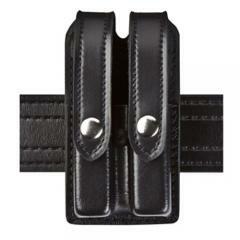 Optimize rig space and keep extra magazines close at hand with the Slimline Double Magazine Pouch from Safariland. Designed to optimize space on overcrowded duty rigs, the holster utilizes a "face-out" magazine orientation to minimize its horizontal space consumption on belts. Full-length cover flaps with nickel plated snaps provide secure closures as well as a professional aesthetic. The flaps not only look great, but protect contents from the elements and ensure magazines stay secured during intense physical activity. The tough, SafariLaminate® construction is weather-resistant and provides the strength needed to withstand the stress of fieldwork and tactical operations. Vertical and horizontal belt slots allow for versatile carry options to meet the needs of any user. The slimline helped me free up some space on my belt, which I love. I'll need to spend some time reorienting to the forward facing mags, which I think in the long run, will be a better setup. Good quality, I like the narrower profile on the belt, saves precious space.